← Is A Small Church A Problem To Be Fixed? I am, like you, a pastor of a a close-knit, loving faith community. I don’t know you but I can only imagine what you’re feeling this morning and so my heart goes out to you and your church family. You had other responsibilities yesterday morning, that took you away from your people and your family. You’d coordinated someone to preach and lead the morning worship in your absence, and then you received the most horrifying news imaginable. 26 of your people were murdered while they gathered to worship Jesus, and one of the murdered was your own sweet daughter Annabelle who you described as “one very beautiful, special child.” My brother, my heart feels some of the shattering that you feel today. You’re going to hear a lot of arguments now. Some will argue that we need to address the easy availability of guns and military grade weapons as the main issue. Others will argue that “guns don’t kill people, bad people kill people” and so we need to stop talking about guns and address mental health as the main issue. 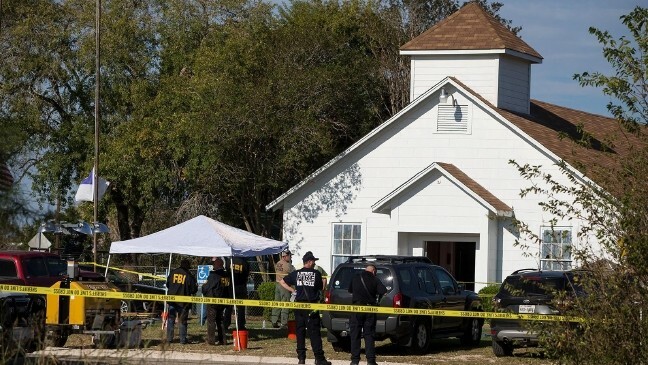 I feel for you as you will sit in the middle of these arguments and you will probably want to scream at everyone to just shut up, and get busy actually trying to work together to find mutually agreed upon solutions to stop the killing fields on America’s streets, concerts, and now in its churches. Frank, there are no words from me that make this horror better, and so I have to go to a place that knows how to describe my heart for you, and your church body, on this sad morning. I can’t go to politics, or social-media, or news, so I go to a prophet named Jeremiah, who walked through utter devastation and horror, and appropriately shows me how to express my heart for you and your church body. Jeremiah didn’t leap to arguments, or go political – he started with a groaning lament of what he saw, and what he felt from the horror that he saw. “Like a bear lying in wait, like a lion in hiding, He dragged me from the path and mangled me and left me without help. He drew his bow and made me the target for his arrows. He pierced my heart with arrows from his quiver. I became the laughingstock of all my people; they mock me in song all day long. He has filled me with bitter herbs and given me gall to drink. He has broken my teeth with gravel; He has trampled me in the dust. I have been deprived of peace; I have forgotten what prosperity is. So I say, ‘My splendor is gone and all that I had hoped from the Lord.’ I remember my affliction and my wandering, the bitterness and the gall. I well remember them, and my soul is downcast within me.